Ruled by a succession of very wealthy Dukes, Burgundy (today parts of France, Germany, Luxembourg, Belgium and the Netherlands) produced some of the most important art of the 15th century. 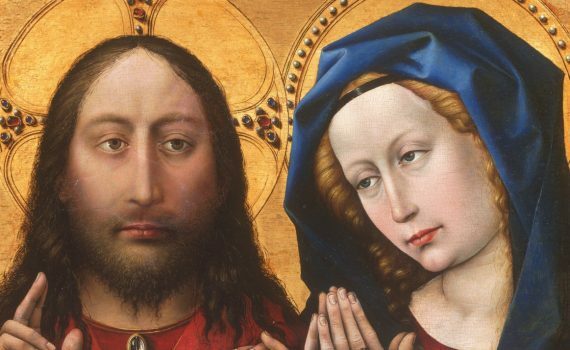 Van Eyck’s enigmatic and iconic double portrait often prompts the question: is the female figure pregnant? Mary cries and falls into John’s arms. Rogier’s precise observations accentuate the emotional impact of this scene. Open this astonishing book and see how three brothers invented compositional devices to unite text and image. This foot-high theatre offers a drama in three acts. A golden thorn claims the starring role. Look closely—not only is the level of detail here astonishing, but these everyday objects embody religious symbols. “As I can.” On the frame to this portrait, the painter humblebrags—and establishes his place in history. Monks, or modern dancers? Robes dwarf these hooded men, but outsized drapery befits their monumental expressivity. Grieving angels and individualized prophets once inspired prayers at this well-funded Carthusian monastery. From the ruffled veil around Mary’s face to the lancet windows of a very Gothic Jerusalem, Rogier revels in detail. So close, yet so far—face-to-face with Christ, we fail to catch his eye. But what’s that reflected on his chest? Who’s that girl? We know so little about this portrait, but mystery only adds to its appeal. Light floods this church from the north. Impossible? That depends on how you see it. 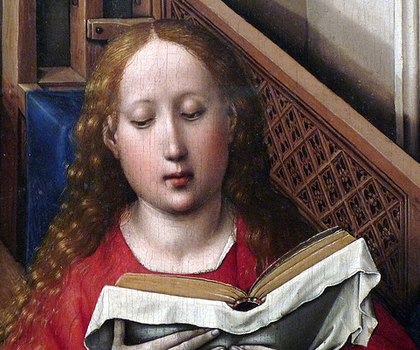 To van Eyck, it was visionary.